If you want to break out of the common pattern of boredom and stagnation in your running, the key is to change variables and introduce novelty. For runners who are always stimulated and excited about running–every single day, this article isn’t for you. Keep doing what you’re doing! For the rest, do you get bored sometimes when running? Maybe you’re running for fitness and getting tired of the same 5KM loop in your neighborhood, or you’re training for your 20th marathon and just not finding your daily runs as exciting. Perhaps the weather is grating on you. Perhaps it’s too many runs in the dark, too many runs in the rain, too much running on the treadmill, or simply too much of the same ole-same ole. It’s not a surprise that we all experience boredom and stagnation from time to time in sport and life. The risk is that many people get stuck there and allow the boredom to turn into apathy, and apathy to turn into giving up. If you want to break out of this common pattern, the key is to change your variables and introduce novelty. Do this before it’s too late though, as it’s easier to keep up than catch-up! 1. Get out of your box: If you’ve never raced, sign-up for a local 5K and pin on your first race number. If you are experienced, register for a race that is very different from your normal racing program. If you’re a road runner, run your first trail race, or if you’re an ultra runner, run a hard 5K through a city. Get out of your comfort zone and habits with this. 2. Make up a challenge and invite others to complete the challenge with you. Be creative — challenges can include obstacles or features in your area (like running a long set of stairs), distance goals, connecting various points, etc. My 40 Hill Workouts Project in 2015 included lots of ideas for challenges– you can also adapt most for non-hilly areas. How about creating your own spontaneously improvised obstacle course race or a run between two CrossFit gyms, doing a quick WOD at each? Refer back to 1 and get out of your box (literally and figuratively). 3. Experience new terrain and/or running surfaces. Run trails if you normally are just on the road. Get out on the track if you’re a trail runner. Also, don’t overlook the simple variations, like running your “normal” home route in reverse or with a few changes introduced. Try running parts of it backwards (yes, literally backwards! ), skipping and sprinting short distances you’ve never sprinted before. I use Strava Heat Maps to find roads and trails near my home that I’ve somehow yet to run and I “paint” my path on them. 4. Run your commute: Run your commute in part or full, or get a ride somewhere and run home. I used to work in an office in the middle of Zürich, and I would sometimes Kayak to work in the morning, run home in the evening, run back to the office in the morning, and kayak home. Those were some of my most productive days in the office, as I was so excited about running and paddling my commute. The novelty brought tremendous energy. 5. Play: Introduce elements of play into your runs. Be spontaneous at times, but also plan for play, with specific activities and locations. This can include adventure and mission-themed runs, or simply jumping and swinging quickly through a playground. I offer examples in Flow State Runner and also in blog posts, such as this one on energizing your long runs. 6. Coach or mentor a new runner. Join a friend on their first run, or first run at a new distance. Write a getting-started training plan for them, or simply encourage them to set a goal and sign-up for a race. One of my favorite marathons was running alongside my buddy Sean on his first. That experience energized my training for a month! 7. Buy something new or use something differently: Change a variable on your body: leave your watch at home or invest in a new one. Add a new fitness gadget, wear different clothes, or wear a new hat or sunglasses. Run a race in a costume or carrying a 10-foot long Swiss Alphorn. Run in new shoes, in strange shoes, or without shoes. 8. Mix it up: Run with a different running partner or group. Train with someone faster. Go for an easy run or weight vest run with someone slower. Enjoy the company of a running friend who is much older. Run with someone much younger. Listen to music that is significantly different from what you’d normally listen to while running. 9. Mix it in: mix in some mid-run functional training, such as squats at the top of a hill and push-ups after sprints. 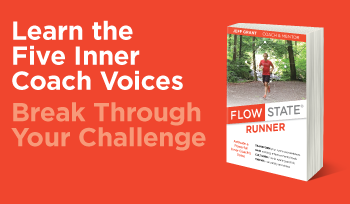 Jeff Grant is the author of Flow State Runner: Activate a Powerful Inner Coach’s Voice. Based in Switzerland, Jeff is a coach and writer who specializes in mental coaching, peak performance, and transformation. Jeff’s popular weekly newsletter is a digest containing inspirational and instructional resources, including his latest content. See recent issues and subscribe for free here. Refer to Jeff’s bio and press kit for more information, and please check out Jeff’s Coach & Author page on Facebook.